This entry was posted in Apps Feed Blog and tagged apps, Google Vault, Rapid Release, Scheduled Release on May 30, 2014 by Jane Smith. This entry was posted in DoubleClick Advertiser Blog and tagged Ads, Advertisers, DoubleClick on May 30, 2014 by Melissa Horwitz. This entry was posted in Google Analytics Blog and tagged Analytics, Google Analytics, Google Analytics Premium, Related Products on May 30, 2014 by Adam Singer. The IMA SDK for iOS version beta7 will introduce some changes in the way you tell the SDK about your display area and companion slots, which lays the groundwork for more versatility in displaying ads. While these new, more versatile features aren’t quite ready yet, we recommend building with beta7 so you'll be prepared to take advantage of upcoming greater versatility and extending support to future iOS platforms. // Create your companion slots. // Give the companion slots to the IMAAdsRequest. // Once ads have been loaded, display the companion ads. // Give the companion slots to the IMAAdDisplayContainer. // Request ads with the IMAAdDisplayContainer. These changes will allow for continued support of YouTube-hosted ads (including TrueView), as well as allow you to provide a custom player for ads further down the road, similar to the HTML5 custom playback option. A custom ad player is not intended to be used by everyone - in fact most of you will not need it - but it will offer support for some additional features in the future. This entry was posted in Google Ads Developer Blog and tagged AdMob, Ads, AdSense, AdWords, Developer, DoubleClick, ima_sdk on May 30, 2014 by Google Ads Developer Advisor. Earlier this week, we announced the beta launch of Enhanced Ecommerce for Google Analytics. It's a complete revamp of our ecommerce analytics, designed to provide richer insights into pre-purchase shopping behavior and into product performance. Enhanced Ecommerce is designed to keep pace with the remarkable rise of online retail, which grew another 30% year over year in 2013. Digital data has played an essential role in that growth, offering deep insights into shopper behavior and letting retailers make smarter decisions. But needs are rapidly increasing and retailers are requiring more sophisticated and comprehensive analysis tools to understand shoppers and product-level performance. With the launch of Enhanced Ecommerce, we’re providing these tools. Enhanced Ecommerce is built on top of the powerful Universal Analytics foundation. It includes tracking code updates (including full support for Google Tag Manager), data model changes, and new end-user reports that address ecommerce-specific use cases. Together they help online retailers see farther and understand customers better than ever before. Analyze how far shoppers get in the shopping funnel and where they drop off. Create product lists for onsite merchandising rules and product landing pages to see which lists and products are best at driving customer engagement. Analyze how internal promotions impact sales, and act immediately on the results. With retailers reporting average on-site conversion rates of around 2.7%, even small improvements can have a big impact. With refund support, Google Analytics now covers the entire shopping lifecycle. Import user segments, based on ecommerce activity, for targeting in your remarketing campaigns. In the chart below, see an example of how the new reports can benefit your business. 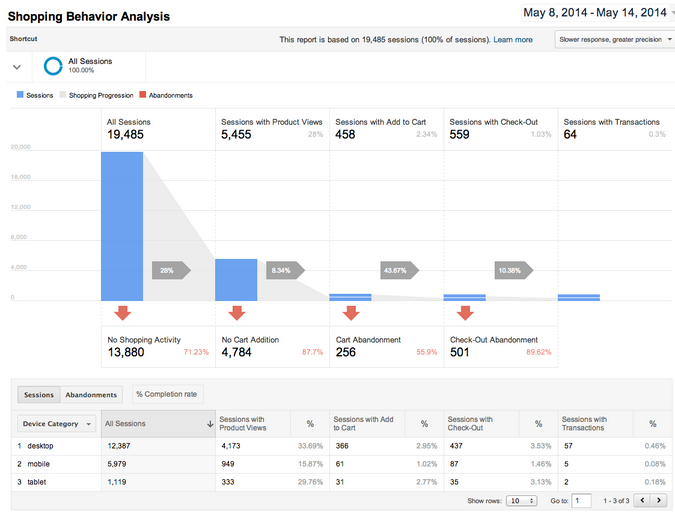 You can create segments directly from the funnel reports to analyze abandoned cart sessions. See which products were abandoned and which devices to target to recapture those users. This data allows you to take immediate action. Enhanced Ecommerce is all about the bottom line. We've designed it to help you improve your total experience and turn more shoppers into buyers. Sign up today for the new Analytics Academy course on Enhanced Ecommerce! Or come learn more at Internet Retailer Conference Exhibition on June 12; Google’s Jesse Nichols will present Enhanced Ecommerce live. You can find more information on getting started with Enhanced Ecommerce in our Help Center and Developer site. This entry was posted in Google Analytics Blog and tagged Analytics, Ecommerce, Features, Google Analytics on May 30, 2014 by Adam Singer. This post will help you configure the attributes of your campaigns in the AdWords API and ensure they're ready for the Search Network with Display Select (SNDS) migration. In v201402, we introduced the displaySelect attribute to indicate the campaign state during the migration period. Consider displaySelect as a transitional flag: it only has meaning when advertisingChannelType is set to SEARCH and both search and content networks set to true in networkSettings. Elsewhere, it can be safely ignored. Starting September 16th 2014, we will begin automatically upgrading legacy Search & Display campaigns. Once the migration is complete, we will remove the displaySelect flag from the Campaign entity and service in a subsequent API release. Therefore, we recommend not setting any value for displaySelect in your campaign creation code, so you don’t need to maintain it later. It is only useful for migrating Search & Display campaigns to SNDS. If you take a Search Only campaign that had contentNetwork = false in its networkSettings, and set that to true in v201402, thereby opting into the Display network, the API will also then set displaySelect to true, so that you don’t mistakenly create a legacy Search & Display campaign instead of an SNDS campaign. If you still have legacy Search & Display campaigns, we recommend you either split or migrate them before we automatically migrate them for you. There are multiple options for migrating, from switching over entirely to SNDS, to splitting your campaign into parts each targeting Display, Search, and/or SNDS separately. We have taken these steps in order to reduce the number of changes required to your code. If you have any further questions about this, or any other, topic, please contact us on the forum or via our Google+ page. This entry was posted in Google Ads Developer Blog and tagged AdMob, Ads, AdSense, AdWords, adwords_api, Developer, display_select, DoubleClick, snds on May 30, 2014 by Google Ads Developer Advisor. This entry was posted in AdWords Agency Blog and tagged AdWords on May 30, 2014 by Nicole Burgan. This entry was posted in DoubleClick Publishers Blog and tagged Ads, DoubleClick, Publishers on May 30, 2014 by JB. This entry was posted in DoubleClick Search Blog and tagged Ads, announcement, DDM, DoubleClick, DoubleClick CAB, Google+, Industry Commentary, live stream, Neal Mohan, Search on May 30, 2014 by Justin Huskamp. This entry was posted in DoubleClick Advertiser Blog and tagged Ads, Advertisers, Announcements, DoubleClick, DoubleClick CAB, Neal Mohan, Programmatic video, Video on May 30, 2014 by Justin Huskamp.